Have you ever thought about what would happen if you integrated chain mail with other materials, like textured metal, leather, wire, and beads? 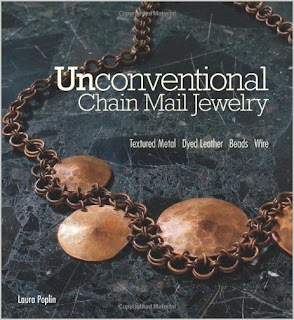 Well, Laura Poplin has given this a great deal of thought, and has come up with a marvelous new book, Unconventional Chain Mail Jewelry. The introduction covers the basics of all the different materials that you'll be working with. Most attention, of course, is paid to the jump rings that you'll use to construct your chain mail, including helpful charts so that you know you're choosing the right rings for the project. I wouldn't say that this is really a beginner's book, but a highly motivated beginner could definitely enjoy working through some of the projects. Unconventional Chain Mail Jewelry actually covers only 5 different chain mail weaves, which surprised me at first. However, the variations are endless, as I soon learned, so my opinion now is that limiting the weaves to some basics like these was a very good idea. If you've been wondering what to try next with your chain mail, you might just find some fabulous new ideas here!